On September 27, 2015, Cheryl Davila addressed the US Campaign to End Israeli Occupation’s Annual Conference in Atlanta, Georgia. After receiving a standing ovation, she told those gathered that she “had faced backlash and was proud of it.” Davila affirmed to the crowd that she was ready to continue fighting for Boycotts, Divestments, and Sanctions (BDS) aimed at making Israel recognize the basic human rights of the Palestinian people. Just a week earlier Davila had addressed a similar crowd under very different circumstances. On September 16 the Berkeley Human Welfare and Community Action Commission held a public hearing on a resolution calling on the city to divest from companies that profit from the Israeli-Palestinian conflict. It was a resolution that Davila had drafted as a member of the commission, a resolution that she helped bring to a vote, and a resolution that had cost her her seat on the commission. According to two new reports – Palestine Exception to Free Speech: A Movement Under Attack in the US released by Palestine Legal and the Center for Constitutional Rights (CCR) and Stifling Dissent: How Israel’s Defenders Use False Charges Of Anti-Semitism to Stifle Debate on Campus released by Jewish Voice For Peace (JVP) – this is not a unique event. While both reports, released today, deal with a time period that predates Davila’s struggle Palestine Legal called it a “canonical example” of what their report chronicles. The two reports combined total 203 pages. Nothing short of that can adequately convey the information compiled in these reports. Each and every example or case study cries out to be the subject of its own article. But this article can only give the general overview and highlight some of the most disturbing trends. For the full picture one must (and should) read both reports. 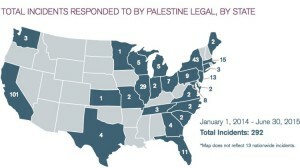 Palestine Legal is “a legal and advocacy organization that protects the rights of Palestinian human rights activists in the United States.” As part of their mandate they accept intakes and requests for assistance from individuals and organizations that believe their rights have been violated due to their support for Palestinian human rights. The Palestine Legal/CCR report draws from those experiences. The Palestine Legal/CCR report is broader than the Jewish Voice for Peace report as it covers repression on more than just college campuses. Yet, the report also illustrates how US college campuses have become the main site of repression for Palestinian human rights activism. 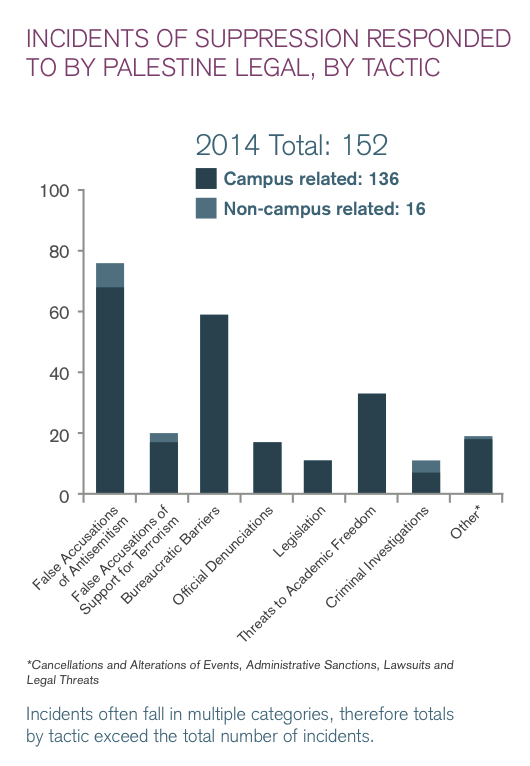 In 2014 89% of reported repression targeted student and scholars. In the first six months of 2015 80% of reported repression targeted students and scholars. The tactics of repression are diverse. They include disciplinary actions against student activists or erecting bureaucratic burdens to the exercise of their free speech. In both cases, colleges and universities oftentimes apply one standard to Palestinian human rights related activism and another to all other student clubs, including pro-Israel ones. Scholars are sometimes fired, denied tenure, or face time consuming investigations into their political beliefs. Other tactics include the filing of frivolous lawsuits and meritless civil rights complaints. In some cases, individuals have been investigated by law enforcement or even criminally prosecuted. One of the most striking features of both reports is the way that outside organizations have intervened in what should be internal disputes. The Palestine Legal and CCR report chronicled how after a small food co-op decided to boycott Israeli products they face a legal challenge from other co-op members. Pro-Israel organizations and even individuals from the Israeli consul met with the plaintiff’s lawyers. According to the JVP report, the American Israel Public Affairs Committee (AIPAC) has bragged that it will work to elect “pro-Israel” representatives to student governments. It is hard to imagine one of the most powerful political lobbyist organizations fixating on student council resolutions or why a nation with the most powerful military in the Middle East would worry about food co-ops in Oregon. Yet, as both reports point out the Palestinian human rights movement is a movement in ascendency. Those who do not like Palestinian human rights are frightened about their political hegemony being challenged and will spare no step in hopes of crushing this powerful, vibrant social movement. Anti-Semitism is a vile form of racism that has provided the ideological background for some of history’s most heinous atrocities. Whether it is Tsarist pogroms, the Nazi Holocaust, the bombing of synagogues, the desecration of Jewish graveyards, or the continued promulgation of bizarre racialized conspiracy theories Anti-Semitism is a serious affront to human dignity that should never be ignored. In spite of the deadly seriousness of this racist ideology, pro-Israel groups have cavalierly and disingenuously tossed around allegations of Anti-Semitism to stifle criticism of the nation-state of Israel and its government. Both reports highlight the particular fixation that organized anti-free speech, anti-Palestinian human rights group have for trying to get universities to adopt the “EU Working Group” or State Department definition of Anti-Semitism. This definition of Anti-Semitism, which was actually rejected by the EU though adopted by the State Department, includes criticism of Israel that delegitimizes, demonizes, or holds Israel to a double standard—all of which are highly subjective and impossible to prove. “Denying the Jewish people their right to self-determination, e.g., by claiming that the existence of a State of Israel is a racist endeavor” is also Anti-Semitic. This means that calling for one secular, multi-national state with equal rights for all, as some in the Palestinian human rights movement do, would be deemed Anti-Semetic. California’s legislature has actually passed a resolution calling on universities to adopt this definition of Anti-Semitism, but none have done so to date. This frivolous invocation of Anti-Semitism is also behind a slate of meritless Title VI Civil Rights Complaints. 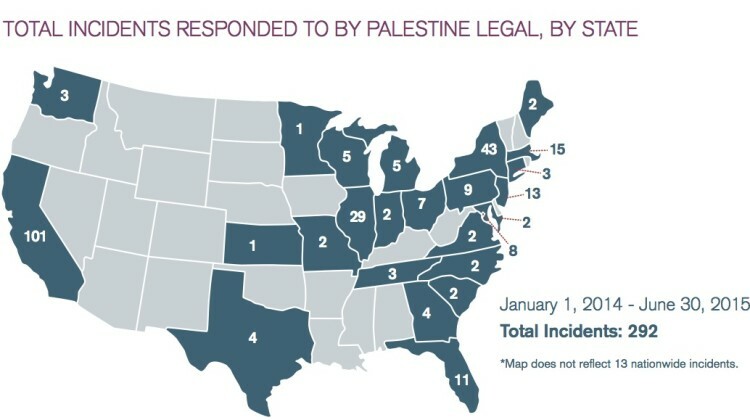 Palestine Legal and CCR have documented six such complaints brought by anti-free speech, anti-Palestinian human rights organizations alleging that Palestinian human rights activism on college campuses created a “hostile environment” for Jewish students. All have been dismissed. The fact that these charges are ludicrous does not make them any less insidious. In post-9/11 United States even frivolous public accusation of support for terrorism can permanently damage an individual’s life. The United States government has used the allegation of material support for terrorism to go after progressive movements, raiding the homes of anti-war activists and threatening those seeking to bring much needed humanitarian aid to Gaza. One university cancelled a student fundraising event for the US Boat to Gaza after an outside organization told them that doing so would violate the material support for terrorism statute. Student activists have even reported being investigated by the FBI. Just as Anti-Semitism and terrorism are bad things, dialogue and civility are surely good things. However, when referring to dialogue and civility anti-free speech, anti-Palestinian human rights group draw from the same lexicon of perversely defined words as they do for Anti-Semitism and terrorism. One of the most frightening aspects of the attempts to crush the Palestinian human rights movement is the way Muslim and Arab students are specifically singled out. Muslim and Arab students who publicly challenge pro-Israel orthodoxy have been subjected to a barrage of racist attacks, oftentimes in the forms of anonymous emails. Before filing the charges the prosecutor met with representatives from pro-Israel organizations to discuss the matter. The judge reprimanded the prosecutor for “tainting the jury pool” with “ethically irresponsible” statements such as calling the students Anti-Semites and labeling them guilty. The same prosecutor “also illegally used subpoenas intended for felony cases to obtain confidential attorney-client communications in the misdemeanor case.” Ten of the students were found guilty and sentenced to three years probation, community service, and a fine. Later at UC Irvine Hedy Epstein, a Holocaust survivor and supporter of Palestinian human rights, was disrupted by pro-Israel student who “yelled threats and racist insults at her.” None of these students were disciplined by the university nor punished by the state. Much of this marginalization comes not from official channels, but Jewish communal organizations, like Hillel, that are supposed to represent all Jewish student on campus, but instead apply political litmus tests. This can result in groups like JVP or J-Street being denied membership in campus wide umbrella organizations of Jewish students or Hillel placing political guidelines on what activities its chapters can engage in. Hillel took things one-step further when it purged a member for participating in an unrelated academic event. Benjamin Sheridan was a student at SUNY Binghamton where he held leadership positions in both Hillel and “Bearcats for Israel.” He was also part of another group, “Dorm Room Diplomacy,” which co-sponsored, along with the political science, sociology, and the office of the dean of undergraduate college, a screening of the Oscar-nominated documentary “Five Broken Cameras.” As part of the screening the brother of the film’s director, Iyad Burnat, spoke. Burnat supports BDS, a position Sheridan publicly opposed. However, because Sheridan participated in this event he was asked to resign his leadership position in Hillel because of the political views of Burnat. JVP has labeled the actions of those suppressing the free speech of the Palestinian human rights movement as “McCarthyite.” This label is fitting. McCarthyism, even amongst civil libertarians who find it odious, is often a misunderstood phenomenon. McCarthyism was not merely an overzealous reaction to a real threat posed by Soviet spies that caused good people to be swept up in a process that violated their liberties and destroyed free expression. McCarthyism was a deliberate attempt to reign in progressive movements, like the labor, civil rights, and peace movements, who seemed to be gaining power. McCarthyism was not just about censoring political ideas, but chilling speech broadly by making examples of those with political heterodoxies by promoting their complete alienation from civil society. McCarthyism did not just seek to ban books about Marx, but make sure those with the wrong political views could not find public or private employment, receive certain government benefits, and denied passports. Subversive organizations were barred from renting hotels. The attacks on the Palestinian human rights movement are McCarthyist in nature. As both reports note, the attacks are a response to the growing strength of a progressive social movement. Additionally, while they do seek to censor ideas they disapprove of they often go much further. Many hope to create permanent blacklists. An anonymously funded organization called the “Canary Mission” keeps a list of student activists for employers to check job applicants against. 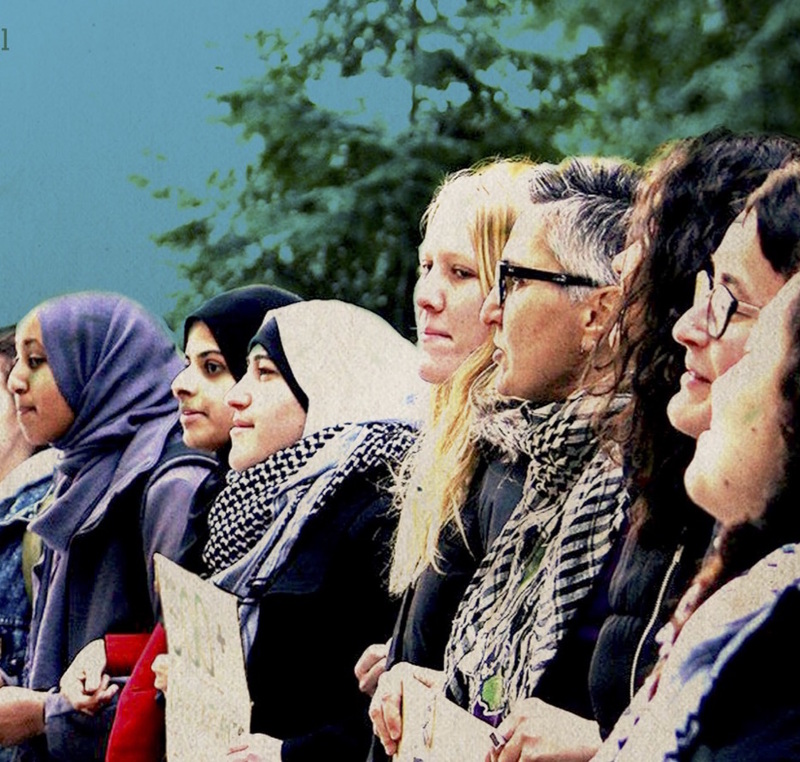 The goal is to prevent students involved in Palestinian rights advocacy from gaining employment in unrelated fields and ultimately deter others from speaking out for Palestine.